In my opinion, eggplants are one of the most under-used vegetables. 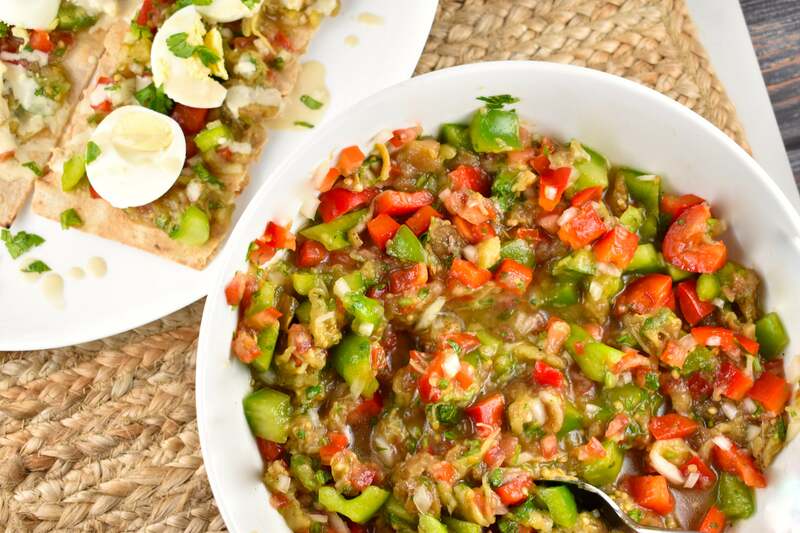 This Roasted Eggplant Salad is a perfect example of how easy they are to use and flavorful the eggplant is. 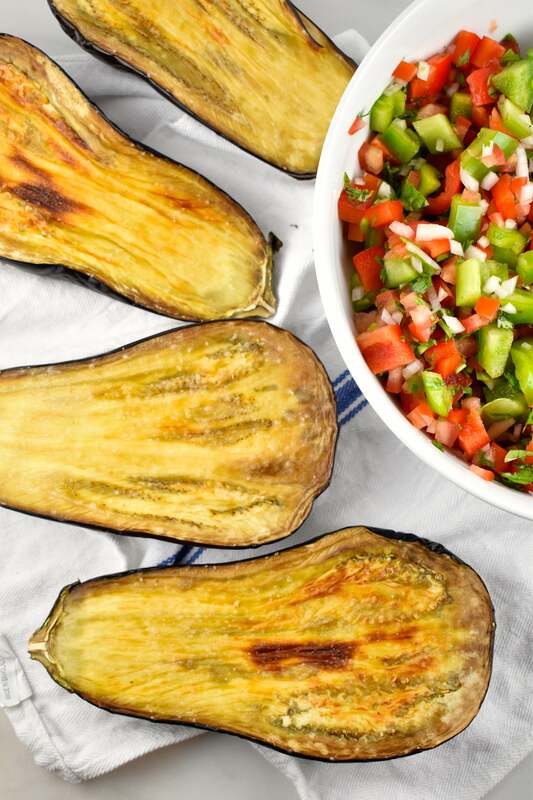 By roasting it, the eggplant develops a beautiful, smoky flavor. 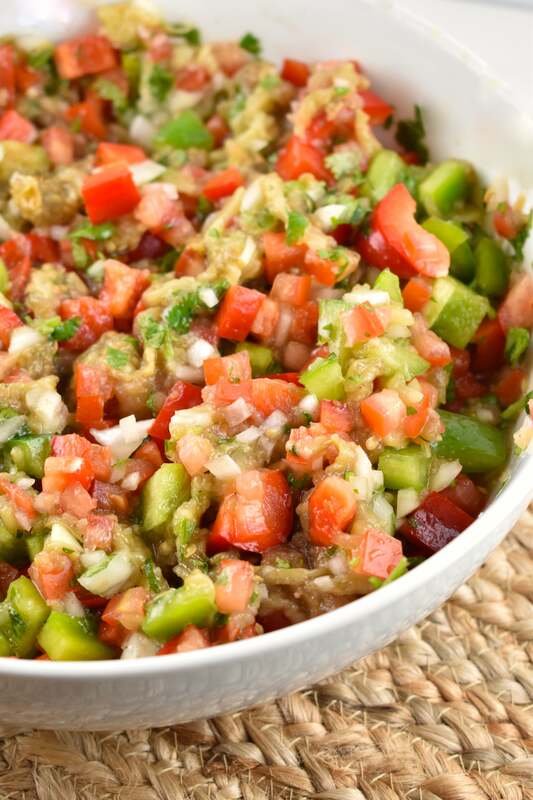 Combine it with the crunchy, fresh bell peppers and onions, then finish it off with fresh lemon juice and olive oil, and you’ve got one amazing mouthful of deliciousness. And since the only ingredient that’s counted in this recipe is the olive oil, each serving comes out to just 1 Smart Point per serving. I’ll use this salad as a topping for my chicken, a dip for my pita, or I’ll add a chopped hardboiled egg to it for protein packed side salad. 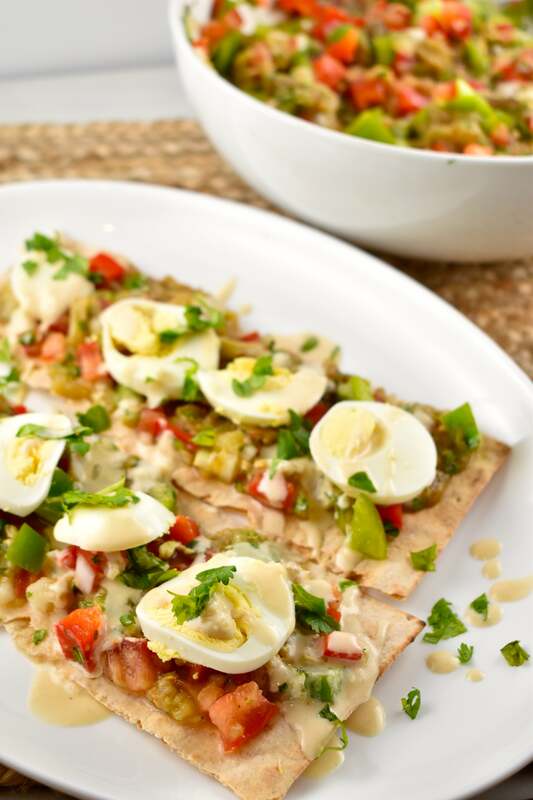 It’s so versatile and so flavorful, you’ll find yourself making it over and over again. 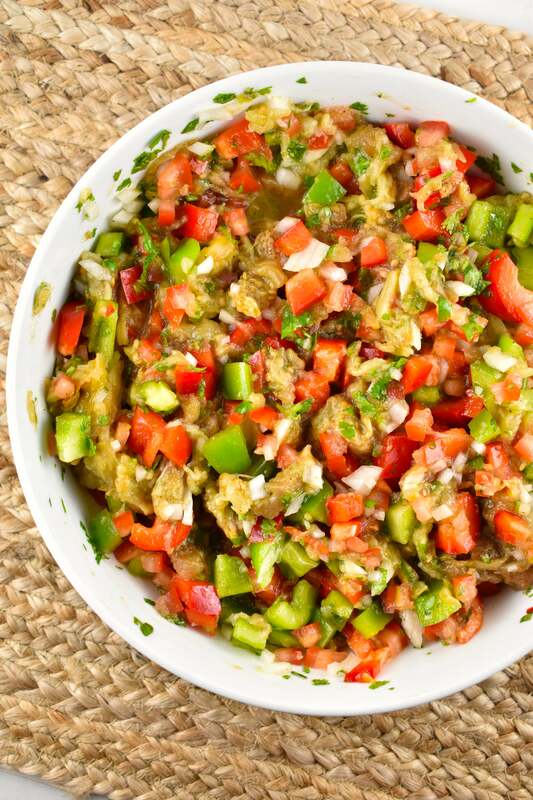 This amazingly flavorful salad is a colorful and healthy side to add to any meal. Super light and low in calories, you’ll get a powerful dose of veggies with each serving. Preheat oven to 400 degrees, and line a baking sheet with foil or parchment paper. Mist with cooking spray. Cut the eggplants in half lengthwise, and place on baking sheet cut side up. Mist with cooking spray, and sprinkle with salt. 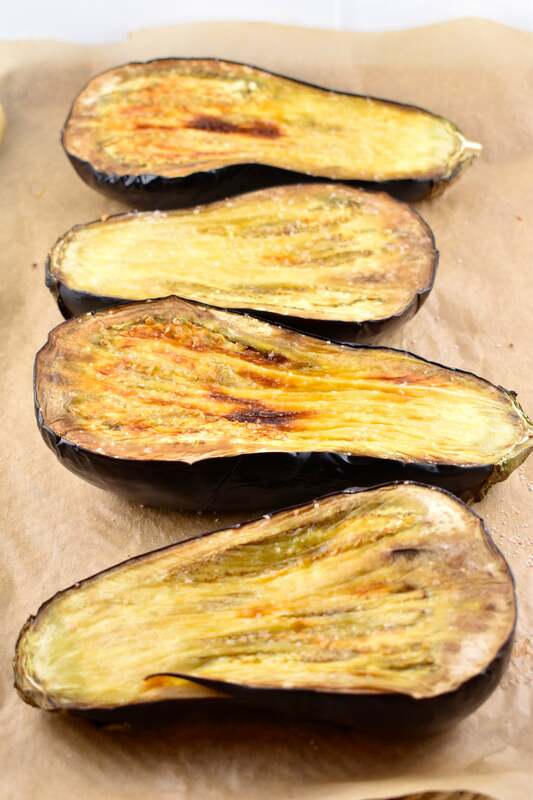 Place in oven and roast for about 20-25 minutes, or until the eggplant becomes very soft and tender, and begins to char. Remove from oven and let cool for about 10 minutes. In the meantime, place all the other diced veggies in a large bowl. Now, scoop out the inside flesh from the eggplant and add it to the bowl. The flesh should be very soft and squishy. Mash it with a fork to help break it apart. Add in olive oil, cilantro, garlic, lemon juice, and salt and pepper and mix well. Serve warm or cold.